A cry goes up from the tavern goers; "Fight, fight!" The drunken brawler circles you, fists raised. To determine who goes first, add up your Body attribute score with any points for the type of combat you'll be employing. So, in this case, any points in Unarmed Combat are added to your roll. Determine who scores the most successes. The winner goes first, but may choose to go last if he or she wishes. 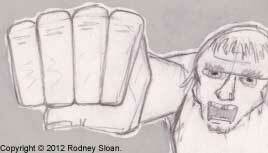 The brawler attacks with 3 dice (Body 2 + Unarmed Combat 1). Roll your defence likewise. The first one to knock the other unconscious is the winner.